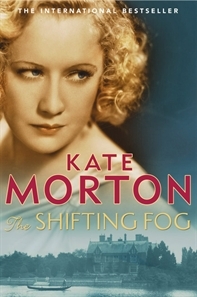 As part of the Australian Women Writers' Challenge, I read The Shifting Fog by Kate Morton this month. There was no hint of an Australian theme in this novel - I had thought it would be about one of the grand settlers households in country New South Wales. Instead, it was about an old English manor with all its tradition. The style jumps around a little in this book. Some of it is written as a film script. Some of it is written like a letter. Most of it is narrated by Grace in the first person, but sometimes it is hard to tell whether she is in the present (1999) or in the past. The story starts on the eve of a glittering society party in the roaring 20s (1924), by the lake of a grand English country house, a young poet takes his life. The only witnesses, sisters Hannah and Emmeline Hartford, will never speak to each other again. Grace Bradley, 98, one-time housemaid of Riverton Manor, is visited by a young director making a film about the poet's suicide. Ghosts awaken and memories, long consigned to the dark reaches of Grace's mind, begin to sneak back through the cracks. A shocking secret threatens to emerge; something history has forgotten but Grace never could. Then Grace starts telling the story from the beginning, further back before the war, when the sisters were still children, and she had just been employed at Riverton. Although the story was quite tragic in many aspects, because the main focus was Grace, I found it very uplifting. She kept a secret that wasn't hers, because of the duty she felt for the family she worked for. However, the novel unwraps lots of little secrets about Grace's life, and also about the connections between characters that aren't evident at first. I thought that everything tied together very neatly, and I think that love won in the end. It was very hopeful. The first world war was a catalyst for enormous social and cultural changes. I was really interested to see how those changes affected a large manor house, and those downstairs in particular. I had never thought of it before. I was so intrigued that I bought and watched the first two series of Downton Abbey straight away, to preserve the feeling of the upstairs/downstairs relationships and interactions. I am really looking forward to reading more Kate Morton novels.